As PennDOT draws closer to issuing REAL ID products in March 2019, customers are urged to educate themselves on whether they are likely to need a REAL ID and pre-verify, if necessary. Because PennDOT may already have electronic documents on file for approximately 35 percent of its total customers — individuals who received their first PA driver's license or ID card after September 2003 — these customers have had the option to apply for REAL ID pre-verification online since March. Most of PennDOT's customers, however, received their initial product BEFORE September 2003, so PennDOT does not have their required REAL ID documents on file. Customers in this group who want a REAL ID will need to bring the required documents to a Driver's License Center so they can be verified in person. PennDOT staff will image the documents to the customer's record, and when REAL IDs are available in March 2019, the customer can opt into the REAL ID program online, and their REAL ID product will be sent through the mail, eliminating any need for this customer to visit a Driver License Center. To obtain a REAL ID, customers will pay a one-time fee of $30, plus a renewal fee (current renewal fee is $30.50 for a four-year non-commercial driver's license or a photo ID). The expiration date of their initial REAL ID product will include any time remaining on their existing non-REAL ID product, plus an additional four years, unless the customer is over 65 and has a two-year license. This expiration date structure means that the customer won't “lose” time that they've already paid for. After the initial REAL ID product expires, the customer will pay no additional fee, beyond regular renewal fees, to renew a REAL ID product. The Department of Homeland Security has granted Pennsylvania a REAL ID enforcement extension through August 1, 2019. 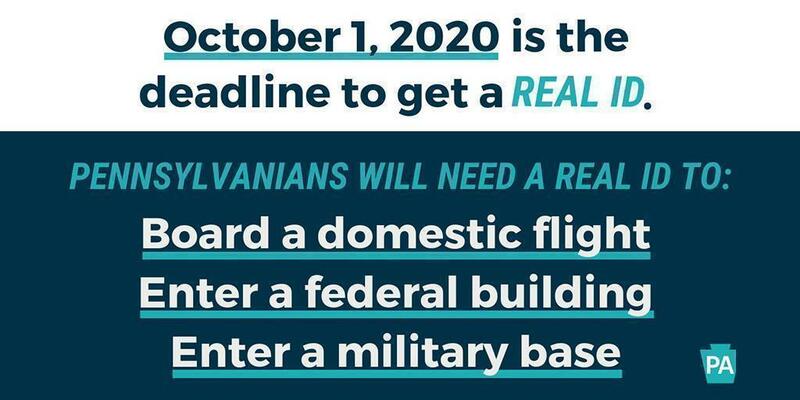 This extension means that Pennsylvania residents will not face access issues when entering federal facilities or boarding commercial aircraft through that date. REAL ID is optional for Pennsylvania residents. A federally-accepted form of identification (whether it's the forthcoming Pennsylvania REAL ID driver's license or ID card, a U.S. Passport/Passport Card, a military ID, etc.) must be used as identification to board a commercial flight or visit a secure federal building on and after October 1, 2020. There is no requirement that any resident obtain a REAL ID and PennDOT will continue to offer standard-issue driver's licenses and photo IDs.